Jay Allen Bruce was born April 3rd 1987 in Beaumont Texas. He was a first round draft pick out of High School getting signed by the Cincinnati Reds. He spent eight 1/2 seasons with the Reds playing in 1220 games, hitting 233 HRs 238 doubles 27 triples while driving in 838 runs. batting .249 with 1196 strike outs & 454 walks. Bruce is a three time All Star & Silver Slugger winner. With the Reds he made three post seasons, never getting further than the NLDS. He hit HRs in the 2010 & 2012 NLDS Series, driving in four runs in the 2012 series loss to the San Francisco Giants. 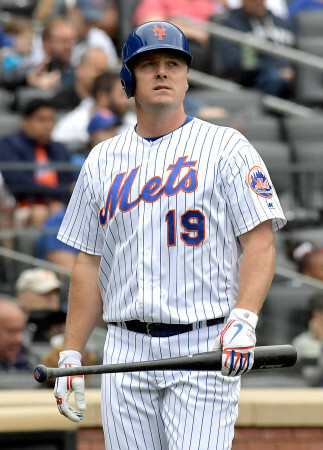 On August 1st 2016 the Mets traded Dilson Herrera & Max Wotell to acquire Jay Bruce from the Cincinnati Reds. 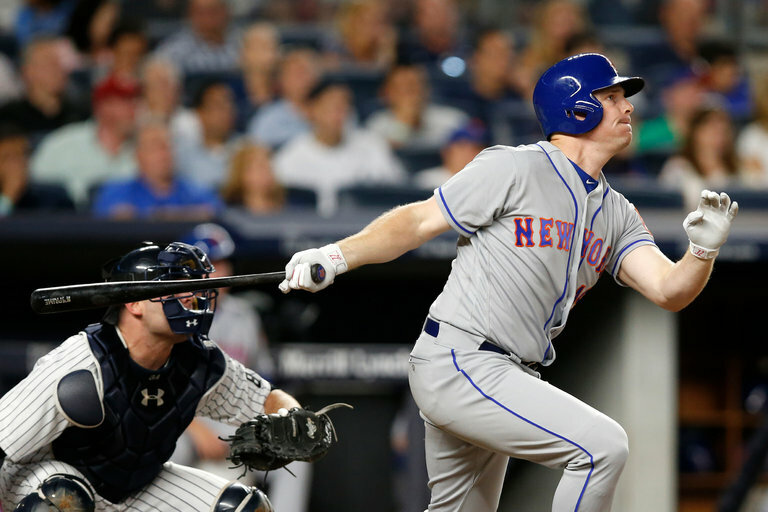 Bruce arrived with the Mets as the NL's reigning RBI leader, his first Met appearance came during the 2016 Subway Series. In his first Mets game he was batting third & playing right field while going 0-4. Two days later he led the Mets to a 4-1 win in the Bronx, as he blasted his first Mets HR, a three run shot. Two days later he hit his second HR as a Met in a loss to the Tigers in Detroit. Bruce's bat stayed quiet as he did not hit anymore HRs in the month of August & only drove in two runs. His struggles since coming to New York, led to some media bashing & fans displeasure. But eventually his power & production led to the Citi Field fans cheering "Bruuuuuuuce". 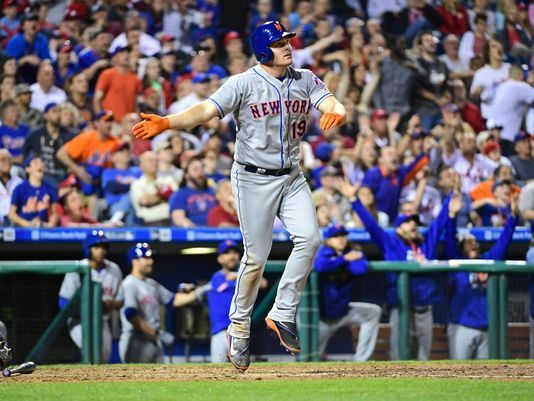 He began the Mets September playoff run, with HRs in two of the first three games of the month. In the final week and a half of the regular season, Bruce hit four HRs in six games from September 24th to September 30th while driving in eight runs. He homered in three straight games as the Mets took two of three in South Florida over the Marlins & two of three in Philly. 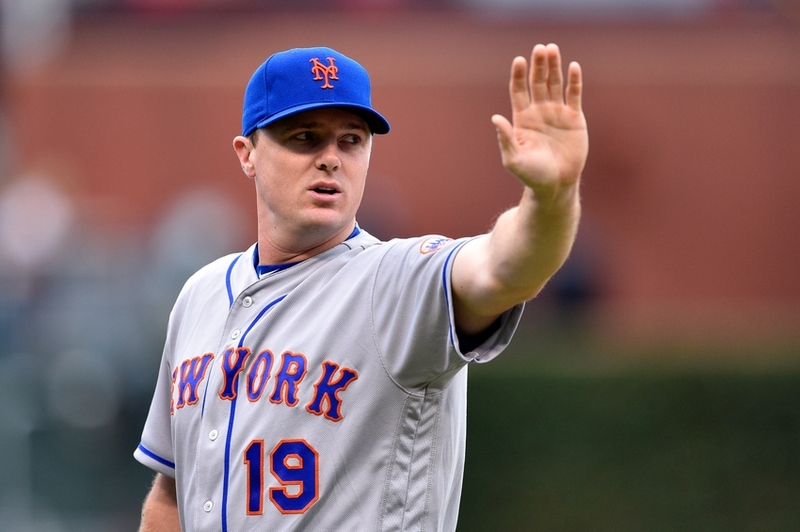 It was his most productive stretch since coming to the Mets helping them capture the NL Wild Card title. He finished 2016 playing in 50 Mets games with 8 HRs 5 doubles 19 RBIs while batting just .219. Overall he hit 33 HRs with 99 RBIs 27 doubles while batting .250. In the outfield, led all right fielders with his 10 assists & three double plays turned. He is 7th among active outfielders with 91 career assists. Post Season: In the Mets Wild Card Game loss he went 0-3 against Madison Bumgarner. As the 2017 season began there was positive vibes around the Mets until everything went sour. Bruce would see some action at first base as well (11 games) with the injuries & eventual departure of Lucas Duda. In right field he would have three assists, occasionally impressing with his arm. On Opening Day Bruce walked three times earning an RBI in the Mets 6-0 win at Citi Field. The next day he hit his first HR of the year. 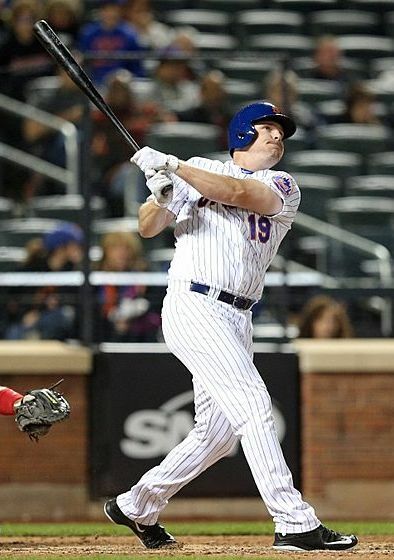 On April 10th he hit two HRs in the Mets 5-4 win over the Phillies in Philadelphia. Nine days later he had another multi HR game, with two HRs & five RBIs. 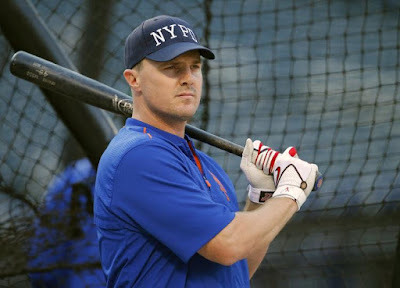 On May 2nd, he hit two more HRs & drove in a season high six RBIs, although the Mets lost 9-7 in Atlanta to the Braves. Bruce hit three more HRs in the month of May. 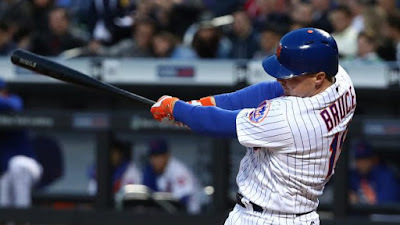 In June Bruce drove in 19 runs & hit seven HRs, a solo shot on June 3rd helped the Mets to a 4-2 win over the Pittsburgh Pirates. 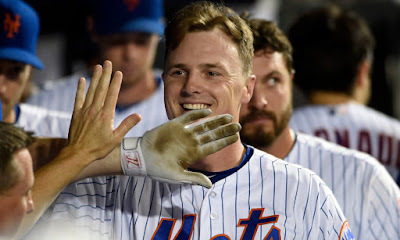 On June 7th he had his fourth multi HR game, it came in Texas as his three RBIs led New York to an exciting 4-3 win. Three day later he hit his 16th HR of the year, a three run shot in the Mets 8-1 over the Braves in Atlanta. On July 4th he started a streak of hitting HRs in three straight games, then hit his twentieth of the season on June 15th in 1 9-3 win over the Colorado Rockies. On a West coast road trip at the end of the month, he had back to back HR games, closing out the month with another seven HRs while driving in 16 runs. 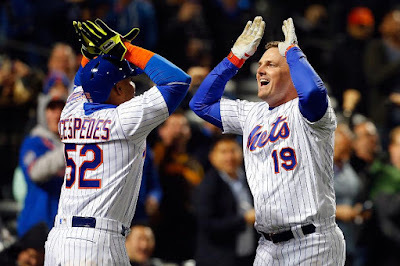 As August began the Mets were dead in the standings with no sign of hope. Bruce continued to produce hitting HRs in the first two games of the month. The Mets had been trying to trade Bruce but nothing good in return was offered. They missed the trading deadline & he was placed on waivers getting picked up by the Cleveland Indians. On August 9th as the Mets began dumping veteran players & salaries, Bruce was sent to the Cleveland Indians for minor leaguer Ryder Ryan. With Bruce added into an already potent line up the Indians went on to win an incredible 22 straight games from August 24th to September 14th. 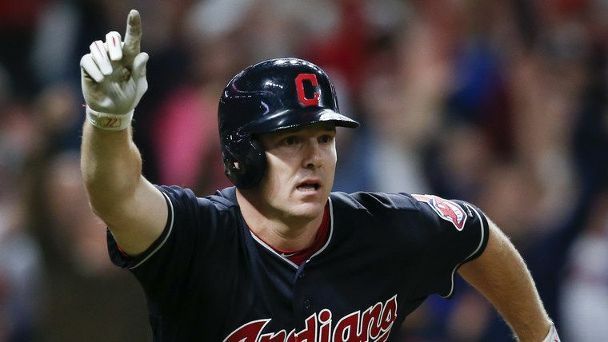 In 43 games with the Indians he hit seven HRs with nine doubles & 26 RBIs while batting .248. Post Season: In Game #1 of the ALDS he had two hits, a double & a HR while driving in three runs in the Indians 4-0 shut out in Cleveland. In the next day he homered again in an exciting 9-8 Indians comeback win. Unfortunately they dropped the nest three falling in the series. In January of 2018, the Mets reunited with Jay Bruce signing him to a three year deal worth $39 million. Many of his team mates showed their delight of him returning to the team as he is a good club house presence as well as good player. Noah Syndergaard & Josh Smoker were among the first to speak out. But Bruce was suffering from Plantar fasciitis which slowed him down as he could could not move as well as normal. He struggled mightily at the plate, batting just .212 with 3 HRs before going on the DL again with a hip injury. He would just play in 94 games overall batting a horrible .223 with 75 strike outs in 319 at bats, 9 HRs 37 RBIs & 18 doubles with a .310 on base %. He later claimed he had a strange conversation with former Mets coach Ruben Amaro Jr. about his mobility, thinking yea I'm injured that's why I can't move well. He felt manager Mickey Callaway had his best interests in mind when he placed him on the DL. Needless to say with younger outfielders Michael Conforto & Brandon Nimmo in the mix, Bruce & his woeful offense was not welcomed anymore. On December 3rd 2018m he was traded to the Seattle Mariners along with Anthony Swarzak, Gerson Bautista & prospects Justin Dunn & Jarred Kelenic for Edwin Diaz, & Robinson Cano. Bruce has played in eleven career seasons in 1510 games, with 1365 hits 290 doubles 30 triples 286 HRs & 875 RBIs. He batted .247 with 569 walks & a .318 on base %. In the outfield he has played 1434 games (1407) in right, with a .984 fielding % 94 assists making 49 errors. 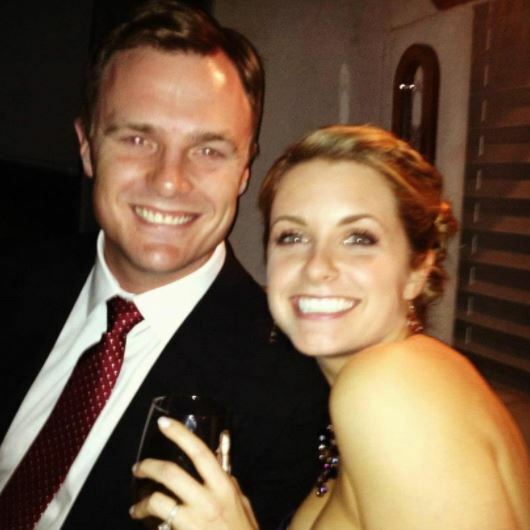 Family: Jay Bruce married his high school sweetheart Hannah in Hoston Texas in April 2016. They have a child named Carter John Bruce.